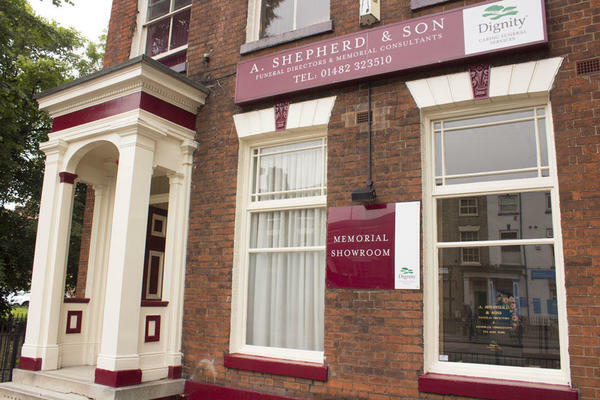 A Shepherd & Son Funeral Directors in Kingston Upon Hull are here to support you at every step during this difficult time. We pride ourselves on our uncompromising compassion and unparalleled quality of service. We can help you to arrange a bespoke funeral for your loved one. Our funeral home has two dedicated chapels of rest for you to use to spend peaceful time alone with your loved one. We will also provide you with refreshments and chapel cards to make your visit as welcoming as possible. We are always here to advise and guide you, offering you the assistance you need whenever you need it. Let us make this difficult time a little bit easier for you and your family. As your local Dignity funeral directors you can get in touch with us 24 hours a day. You can reach us on 01482 323510 whenever you need us, so please call us at a time that suits you. Call us today on 01482 323510 to talk through your personal requirements. At A Shepherd & Son Funeral Directors, we understand how special life is with those that you love. For us, every funeral is unique and personal. We have a service to fulfil every wish, with every detail carried out with the same uncompromising quality of care. From a traditional service, to a colourful woodland burial, your options are limitless with our Full Service Funeral. If you have a little more flexibility when it comes to arrangements, then we can provide a Simple Funeral for a lower cost. Our closest on-street parking is on College Street, off Beverley Road. Please call us before your visit for help with directions. Our staff are available 24 hours a day on 01482 323510 if you require our services outside of these hours. During this difficult time everybody who spoke up us were helpful, kind, considerate and thoughtful. We were treated with dignity and respect at all times. Thank you for posting your online review. I am glad we were able to provide you with the support and guidance needed and that you were so well looked after by our team. The service we received was second to none . Our loved ones and ourselves were treat with the most utmost care and respect. Thank you for posting your online review. I am pleased that our team provided the highest level of care and guidance. As a family we cannot fault the service provided to us by A Shepherd. The service provided to us by staff was excellent and from the start we felt that we were in safe hands. All the arrangements were well taken care off and the funeral went aswell could be expected. Would certainly recommend to others. Thank you for taking the time to send your online review to us. I am pleased that we provided the highest level of care and guidance to you and your family and that you were so well looked after by our team. Staff was friendly and helpful at this distressing time. They organised everything how we wanted it to be. Thank you for posting your online review. I am pleased we were able to help make things easier for you at such a difficult time and that you were so well looked after by our team. At times like this there is so much to think and worry about so it was really good that John took all this out of our hands and managed everything perfectly. The advice and help meant we could deal with other matters and not have to worry about the funeral. Well done to all. All the staff were wonderful looking after my Mam with such respect and professionalism, I cannot express how you all made such a difficult time so much easier,Sam,Lucy,Steven and Michael (hopefully I have got the names correct) in particular showed such care and compassion and everything from you all caring for Mam and making her look so beutiful to the actual funeral itself,everything was perfect just what we wanted,I think its a lovely touch that you knock on the door of the chapel of rest before entering,little things like that bring great comfort at such a sad time,again thank you everyone at A.Shepherd and Son. I would like to record how professional and understanding John and his team where with the handling of my Mothers funeral arrangements, at such a sad time all concerned treated myself and my family and especially my Mam with so much respect it was more than I ever had imagined . This is the third time Shepherds have dealt with a bereavement in my family and all of them were as the above. If any of my associates ever ask about a Directors I will be putting forward Shepherds . Many thanks MR M Wilson . Thank you for the kind comments posted on your online review. I am pleased that you were so well looked after by our team and that we were able to provide you with the care and support needed at this time. Moore Stan. Died 25th September 2018 aged 57. We had a celebration of life service. It was conducted really lovely. His daughter Joanne sang To Make You Feel My Love. And Irene Kapinsky did the service. I would like to thank everyone for the flowers and messages of sympathy. And Shepherds Beverley Road for the dignity and respect shown to my son and the whole family. Thank you for the kind comments posted on your online review. I am pleased that you and your family were so well looked after by our team and that all of your wishes and requirements were carried out as you had requested. A very professional, caring and dignified service. Friendly staff made a difficult time much easier. Funeral arrangements were just as we wanted with all our personal touches catered for. Thank you for sharing your experience with us on your online review. I am glad that all of your wishes and requirements were carried out by the team as you had requested and that we were able to help make things easier for you at such a difficult time. As a family we found Shepherd and Son a perfect combination of professionalism with a true sympathetic approach to our loss. Nothing was too much trouble and all needs met. I found the calm dignified approach a great comfort and knew mum was treated with respect throughout her stay with you. During visits to mum I was especially moved by the respect shown even to the fact that the staff actually knocked on the door before entering room where mum lay. Bereavement is always difficult but the staff eased the pain for us all with their truly attentive service. Staff kept in touch at appropriate times and ensured the funeral was everything we expected it should be. Thank you to you all for the personal touches which meant so much to us all. I would have no hesitation in recommending Shepherd and Son once again thank you. Thank you for taking the time to send your online review to us. I am pleased that you were so well looked after by our team and that we were able to provide you with the care and support needed to help make things easier for you at such a difficult time.